The heart of today’s project is the WiFi enabled board that needs no introduction; the ESP8266 based NodeMCU development board. It is an open source platform for developing WiFi based embedded systems and it is based on the popular ESP8266 WiFi Module, running the Lua based NodeMCU firmware. NodeMCU was born out of the desire to overcome the limitations associated with the first versions of the ESP8266 module which was not compatible with breadboards, it was difficult to power and even more difficult to program. 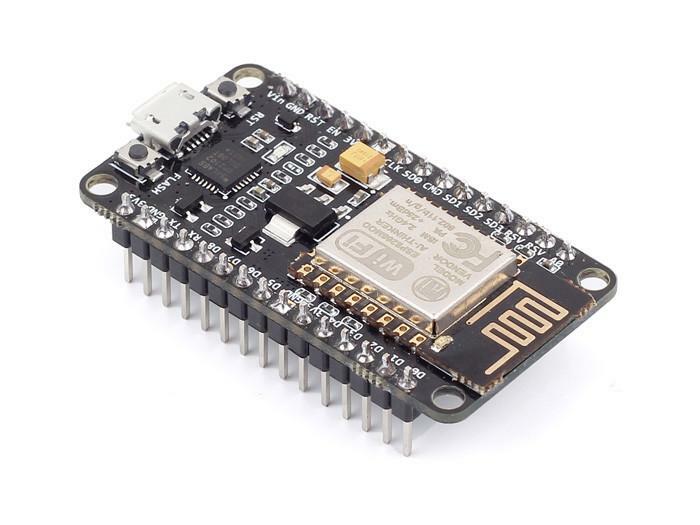 The NodeMCU board is easy to use, low cost and that quickly endeared it to the heart of makers and it is one of the most popular boards today. 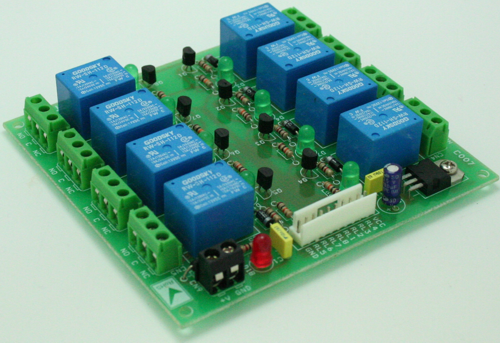 For today’s tutorial, we will add a 2-channel relay module to the ESP8266 board. 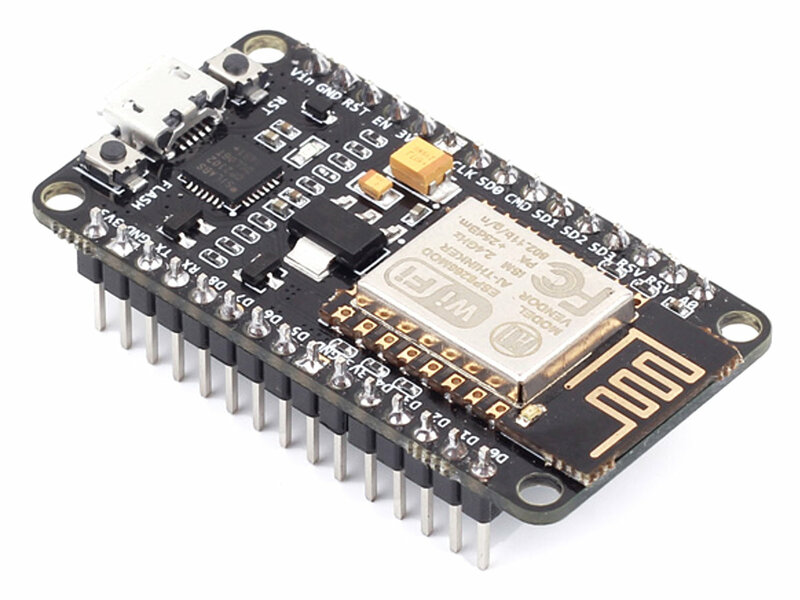 The project flow involves the control of NodeMCU’s GPIOs from a webpage on any device connected on the same network as the board. The status of the GPIOs control the coils of the relays and that causes the relay to alternate between normally open (NO) and normally closed (NC) condition depending on the state of the GPIO, thus, effectively turning the connected appliance “ON” or “OFF”. 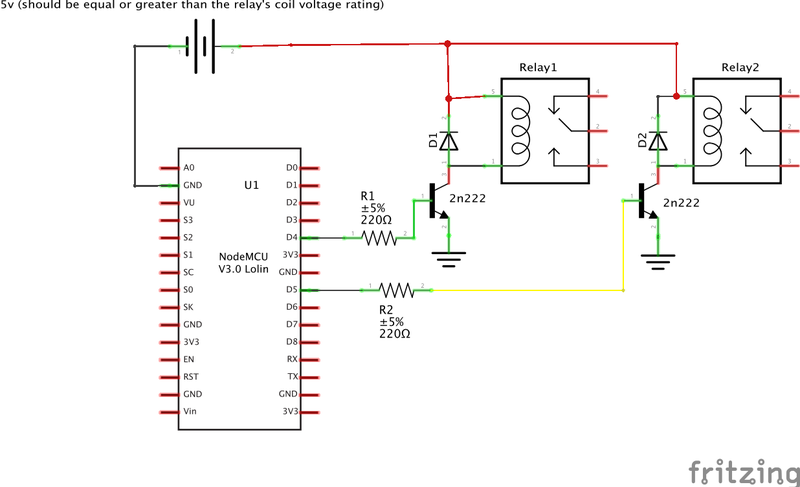 It’s important to note that, connecting the appliances to the relay involves interaction with AC voltages which could be dangerous. Ensure you have experience interacting with AC voltages and do so in a safe manner. The schematics for this project is quite simple. Connect the components as shown in the diagram below. To make the connections easy to follow, here is a pin map of the connection between NodeMCU and the relay module. If you are using the ordinary relays without the module supporting circuit, connect the relays to the NodeMCU as shown below. Ensure the relay’s coils are rated 5v or change the 5v supply to match your relay’s rated coil voltage. With the schematics done, we can then move forward to write the code for the project. One of the easiest way to program NodeMCU is via the Arduino IDE. This, however, requires setting up the Arduino IDE by installing the board support file for NodeMCU. If you are using the Arduino IDE to program the NodeMCU for the first time, you need to do this first before proceeding with this tutorial. 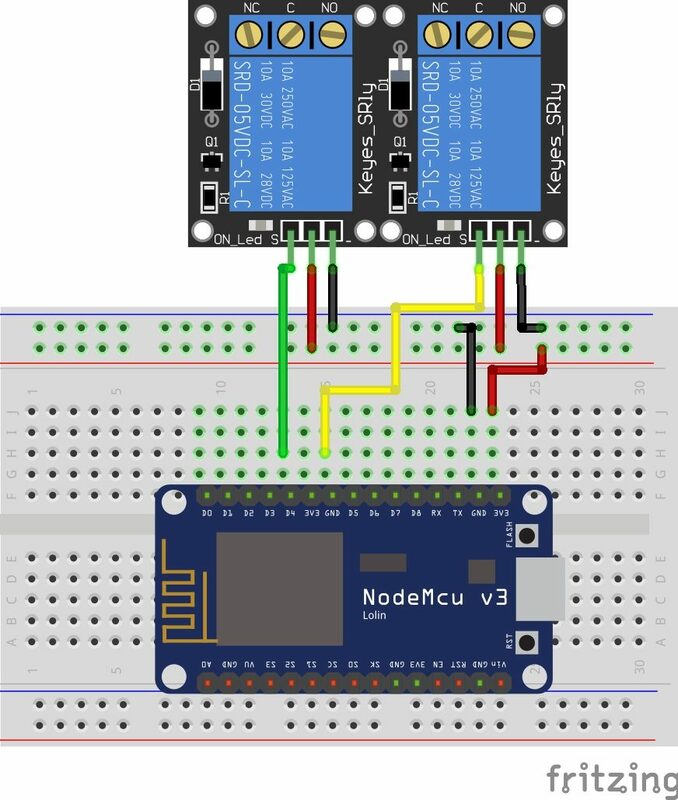 Follow the detailed tutorial “Getting Started with the NodeMCU” to learn how to set up your Arduino IDE to program ESP8266 based boards. 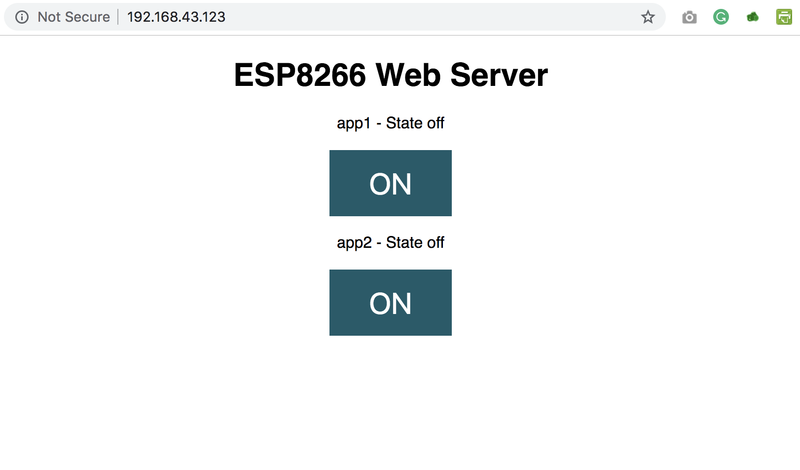 The code for today’s tutorial is a modified version of the code from the last article “NodeMCU ESP8266 WebServer Tutorial“. The code is based on the ESP8266WiFi.h library which allows the easy use of WiFi functionalities of the board. It contains all we need to create or join a WiFi access point and also create a server and client which are all important for today’s project. The library comes attached with the NodeMCU board files for the Arduino, so there is no need to install it once the board files have been installed. The code for today’s tutorial will enable us to control appliances connected to the GPIOs (via relays) of the NodeMCU board remotely. To start with, we include the library that we will use for the project, which in this case, is the ESP8266WiFi.h library. Next, we add the credentials of the WiFi access point to which the NodeMCU will be connected. Ensure the username and password are between the double quotes. We also specify the port through which the system will communicate and create a variable to hold requests. Next, we declare the pins of the Nodemcu to which the relay pins are connected and create variables to hold the state of each relay. //you can add more more appliances below. Next is the void setup() function. We start by initializing the serial monitor (as it will be used for debugging later on) and setting the pinModes of the pins to which the relays are connected as output. We then set the pins “LOW” to ensure the system starts at OFF state. 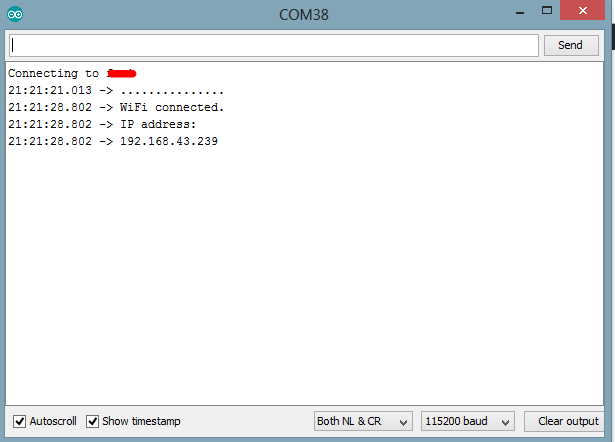 Next, we connect to the access point using the credentials provided as arguments to the WiFi.begin() function and we use the WiFi.status() function to check if connection was successful. The system will keep trying until the connection is successful. If the connection is successful, a text is printed on the serial monitor to indicate this, along with the IP address of the NodeMCU. This IP address becomes the web address for the server and should be entered on any web browser on the same network as the server so we are able to access it. Next, we start the server using the server.begin() function. Next, we write the void loop() function. This is where a bulk of the work is done. We start by using the server.available() function to listen for incoming connections by clients (web browsers). When a client is available and connected, we read the client request and send a header as a response. Next, the client’s request is examined to see if it indicates a button press on the web page. If it does, the state of the GPIO is changed accordingly to the request. If the request indicates “ON”, the pin is turned HIGH and the state variable is updated accordingly. Next, we create the webpage that will be displayed and updated by the NodeMCU as the user interacts with it. The key function for this is the Client.println() function which is used to send HTML scripts line by line to the client. We start by indicating that the next few texts to be printed are HTML lines as declaring by doctype. Next, we add the lines below to make webpage responsive irrespective of the browser being used. Next, some bits of CSS is sent to the client to make the web page look welcoming. You can edit this to add your own color, font style etc. Next, the webpage header is sent followed by the buttons and the buttons are set to display the current state of the appliances. They will show OFF if the current state is ON and vice versa. Next, we close the connection and the flow goes back to the top. The complete code for the project is available below and also attached under the download section. Upload the code to the NodeMCU. Ensure everything is connected as described under the schematics section. After uploading the code, you should see the IP address of your web server displayed in the serial monitor as shown below. Copy the IP address and paste it in a web browser on any device (Mobile or PC) connected to the same network as the NodeMCU. You should see the web page and be able to toggle the connected appliances by clicking the buttons. That’s it for this tutorial. Thanks for reading. As mentioned above, this tutorial could serve as a building block for more complex web servers and IoT solutions. What will you build? If you have any question about today’s tutorial, please feel free to share via the comment section.